The report submitted by Special Counsel Robert Mueller that exonerated President Trump on the charge that he colluded with the Russians. Right now, they’re having an epic meltdown over that fact. They wanted indictments. They wanted a roadmap to impeachment. Well, that plan was torched. The media hasn’t been this salty since the 2016 election. I love it. Sorry, this is just too good. At the same time, while Democrats are whining about Trump’s deep ties to America, it does bury an issue (for now) that was engulfing the party: allegations of anti-Semitism. 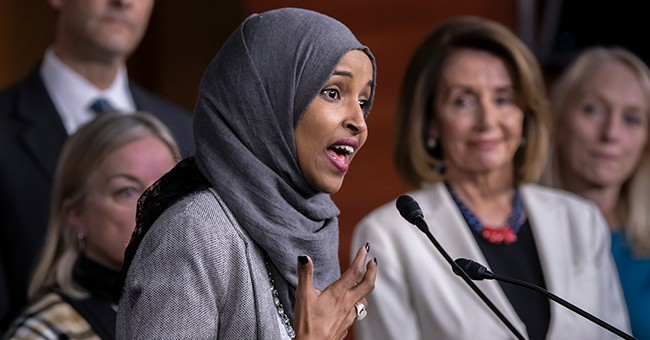 Rep. Ilhan Omar (D-MN) has been playing bigotry’s greatest hits on that front, which forced House Democrats to vote on a resolution that was supposed to condemn anti-Semitism. It was watered down after radical elements thought it could single out Omar. What was voted on was a watered down piece of garbage resolution that was against…bad things. The content of these speeches, given to predominately Muslim audiences, remains unknown, prompting some of Omar's critics to express concern about the type of rhetoric she is using before these paying audiences, particularly in light of the lawmaker's repeated use of anti-Semitic tropes in public. Omar's appearance at these closed-door forums is raising eyebrows in the pro-Israel world due to her repeated and unapologetic public use of anti-Semitic stereotypes accusing Jewish people of controlling foreign policy and politics. With Omar's popularity skyrocketing on the anti-Israel left, it appears her rhetoric is translating into fundraising prowess. So, is this treason? You can debate that among yourselves. It’s becoming quite clear that Omar has a Jewish problem. She was educated here. She’s lived here for nearly a quarter-century. Speaker Pelosi tried to defend her by pretty much saying she was too dumb to know what she was saying about Jewish people and supporters of Israel. So, then why is she on the foreign affairs committee in the House if she’s a moron? She knows. Democrats have gone to absurd lengths to rationalize her appalling remarks, even going so far as to downplay the Holocaust. Dr. Sebastian Gorka was on the Triggered podcast recently and he was unequivocal that Omar hates Jewish people and Pelosi caving to these radical elements, and being unable to control them, will produce a serious problem for the Left in the long term. When that happens, grab the popcorn.